Clayton Thorson runs with the football. The junior quarterback completed 11-of-29 passes against Duke. Northwestern is stuck in the mud. The Wildcats (1-1) couldn’t overcome a slow start, falling to Duke (2-0) 41-17. An early Jared McGee targeting ejection left the already shorthanded NU secondary on its heels, as Blue Devils quarterback Daniel Jones shredded the Cats for 305 passing yards and 108 rushing yards. Duke finished with 538 total yards Saturday, and NU’s offense couldn’t keep up. The Cats wrap up their non-conference slate next weekend hosting Bowling Green. Following a bye the next week, NU begins its Big Ten schedule at No. 9 Wisconsin on Sept. 30. 1. NU’s offensive line is struggling. 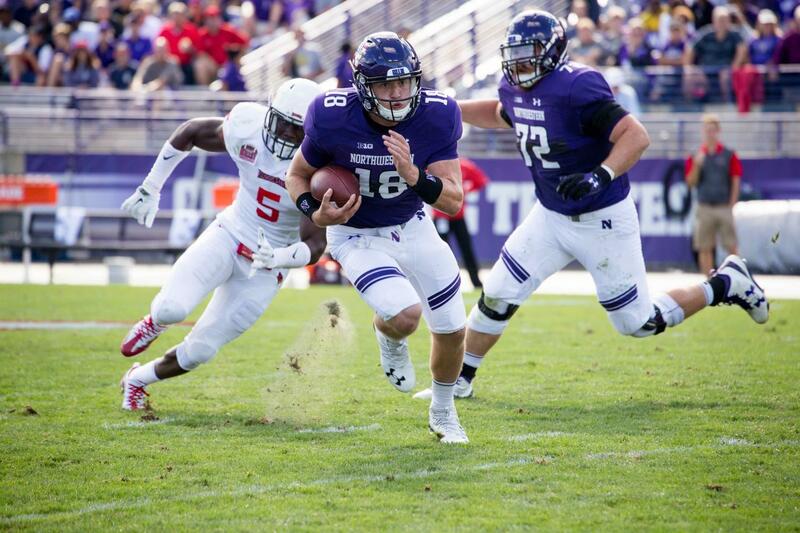 NU’s running game, a key cog in its offense over the past few seasons, couldn’t get anything going Saturday. The offensive line hasn’t always been great over that span, but senior running back Justin Jackson normally makes up for the line’s poor play. Take last week: the line didn’t give Jackson much room against Nevada, but Jackson still found some success, with 109 yards on 30 carries. That wasn’t the case against Duke, as Jackson managed just 18 yards on the ground. 2. Mobile quarterbacks give the Cats trouble. Nebraska’s Tommy Armstrong Jr. gave the NU defense fits last year, and Jones similarly confounded the Cats on Saturday. Jones evaded NU’s defense all afternoon, scrambling for extra yardage and completing passes on the run. Jones’ play helped Duke dominate on third downs, as the Blue Devils converted 15-of-22 opportunities compared to the Cats’ 1-of-10. 3. Clayton Thorson couldn’t come through. The junior quarterback upped his game when the Cats struggled last week against Nevada, but he never found a rhythm against the Blue Devils. The offense had one good drive at the end of the first half to enter the break down 21-10. After the defense forced a three-and-out to open the second half, it looked like Saturday might play out similar to last week. But Thorson threw an interception on the following series, stunting any momentum NU had. Duke scored 20 unanswered points to put the Cats away, and Thorson ended the game just 11-of-29 with two picks. -Duke time of possession: 41:18. -NU: 15 first downs. Duke: 34 first downs.